A webinar is a workshop, tutorial or other demonstration broadcast over the web. Typically held through web conferencing, webinars are educational in nature and allow businesses to demonstrate the value of their products, services and expertise directly to prospects or existing clients without spending money to meet with them. 64 percent of marketers in a On24 study said they host webinars to promote their brand, and 19 percent of brands in a BrightEdge survey said webinars are the most valuable component of their content marketing strategies. Webinars are generally in the form of slide decks. While webinar marketing is a great tool for lead generation, the webinars, themselves, must be informative and cater to the learning needs of customers or prospects. 64% of marketers use webinars to promote their brand, and 19% say it’s the most valuable component of their content marketing strategy. The subject matter of a webinar should focus on the general ideas you express in other forms of content, with the main difference lying in the delivery. Webinars should focus on key pieces of information or ideas that your audience has expressed an interest in understanding. The presentations should focus on educating attendees about industry best practices, the benefits of a particular product or service and/or the trends that cause demand for a service. According to Savvy B2B Marketing, webinars should highlight what is in it for prospects. It’s important to offer unbiased information, but balance this with an angle that would make viewers select the sponsor’s product as opposed to another vendor. What can you give them that another company cannot? 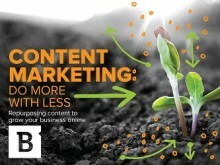 Additionally, webinars like other forms of content marketing, should convey succinct messages. Webinars tend to run an hour, including Q&A time, but businesses must avoid superfluous information that will distract from the actual message. Webinars have enabled businesses to add a highly interactive element to content marketing campaigns that may be more effective in reaching some prospects than other forms of content. Webinars allow prospects to listen to experts discuss uses, benefits and demand for certain products and services while gleaning insights about the unique benefits businesses provide. Moreover, those viewing the webinar can typically ask questions during or after the presentation. Like most forms of new media marketing, this helps improve the accessibility of a business, which can move prospects closer to conversion. Pairing webinars with blog posts and other website content (as well as placing calls to action at the end of the presentations) can direct prospects through conversion funnels.